Buddhists from the Newar Community in Kathmandu celebrate the month-long Gunla festival, marking the holy significance of the month that is dedicated to Lord Buddha. Devotees celebrate the festival offering early morning prayers at Buddhist temples, reciting scriptures and playing Gunla music. Devotees believe this is the month in which Lord Buddha had got enlightened. As a part of the festival, different traditional musical instruments, called Gunla in Newari, are played across various areas of Kathmandu. 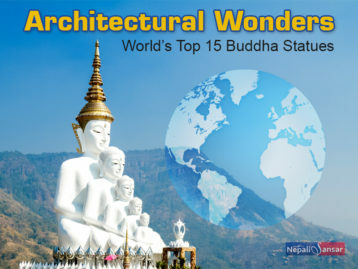 Devotees form groups and go on pilgrimage to various Buddhist temples. Changunarayan, Swoyambhunath, Bangalamukhi, Shova, Bijeshwori, Bhagwati, Janabahal, Maruganesh and Suryabinayak are some of the famous places that are visited as part of the pilgrimage. Devotees visit Dattatraya temples on Nag Panchami, Janai Purnima and Krishna Janmasthami. According to Hari Ram Joshi, the cultural expert, Gunla festival is celebrated in the ninth month of the Nepal Sambat calendar. “From the full moon day of the ninth month of Nepal Sambat, the festival is celebrated for a month,” says Joshi. As part of the festival, a special ceremony called Bahidyah Bwayegu is performed, where large images of Dipankura Buddha and Paubha paintings are displayed at sacred courtyards. The practice of observing the festival came from the concept of rains retreat during Buddha’s time, where monks remained at a place and taught dharma.